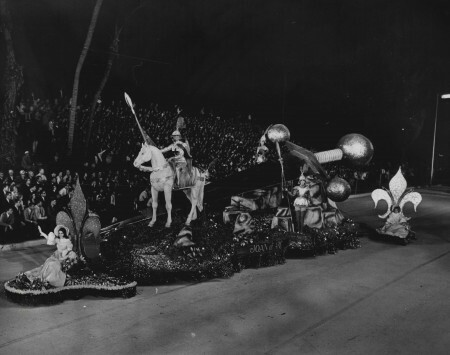 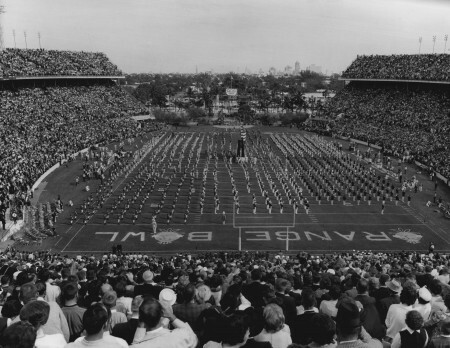 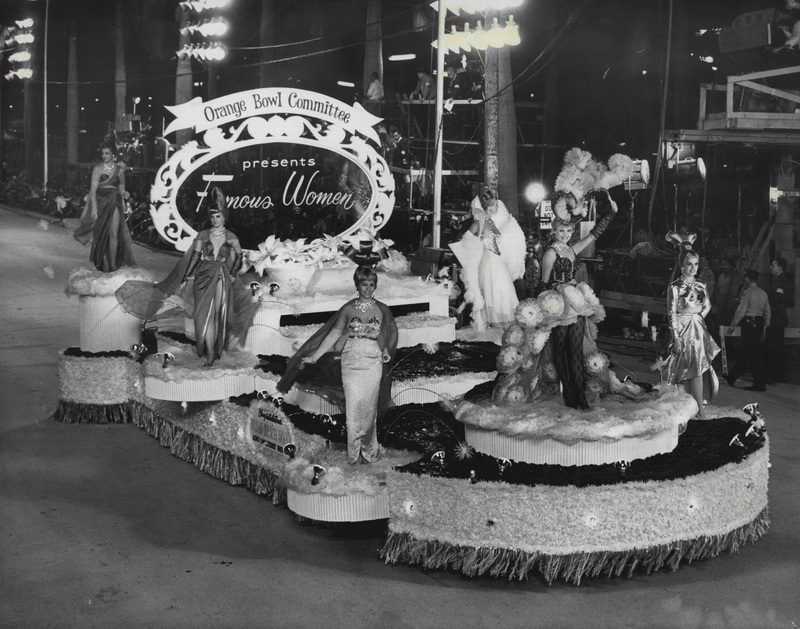 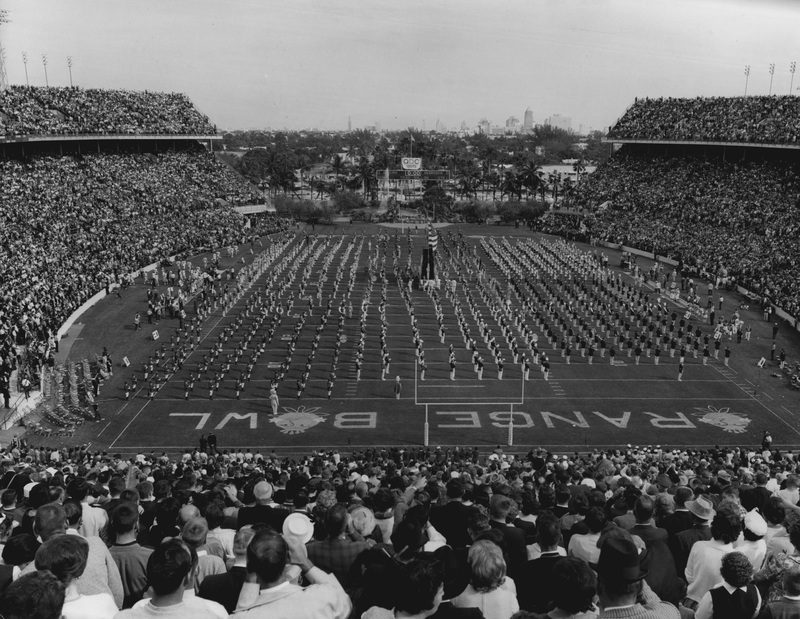 The first Orange Bowl parade was held on January 1, 1936. 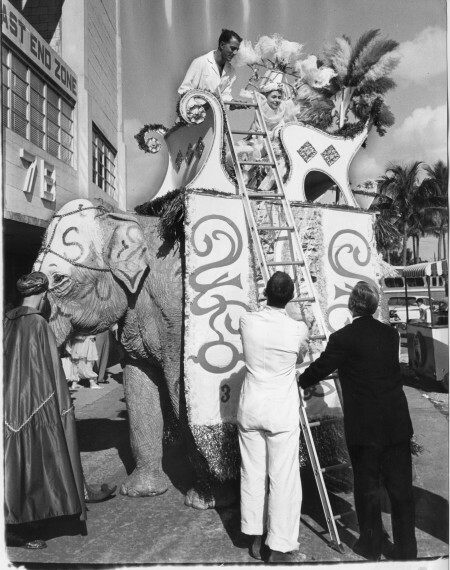 It was part of a festival intended to attract tourists and support the University of Miami football team. 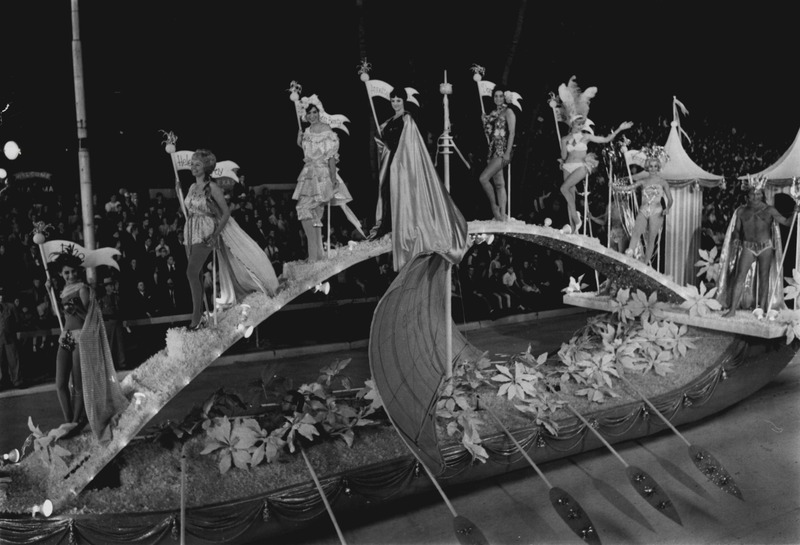 It featured 26 floats and eight bands. The parade, which bumped along from Biscayne Boulevard to Southwest 12th Avenue, was held every year except three during World War II. 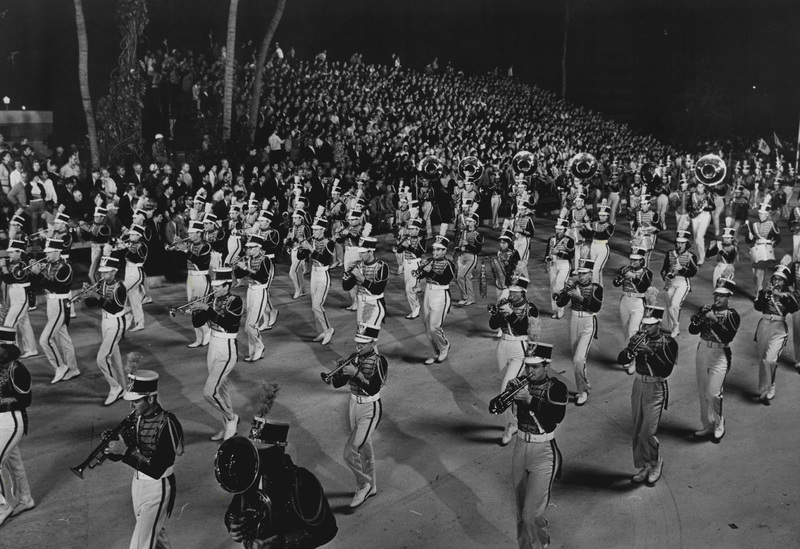 In 1939, bleacher seats cost 55 cents and box seats were $1.10. 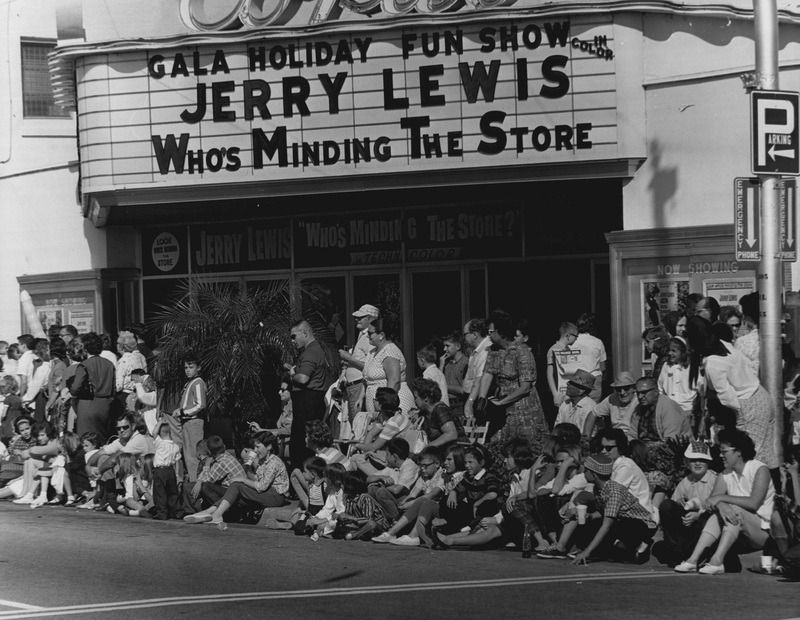 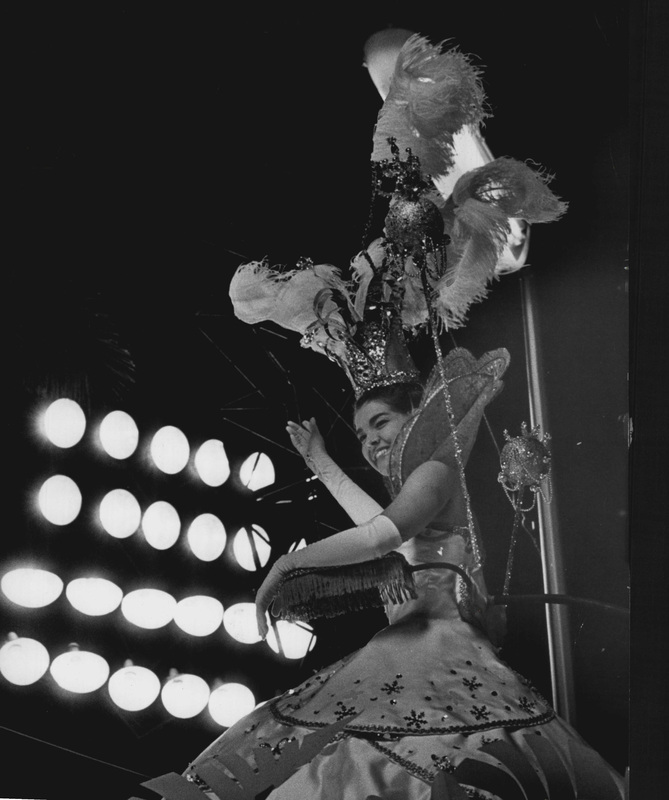 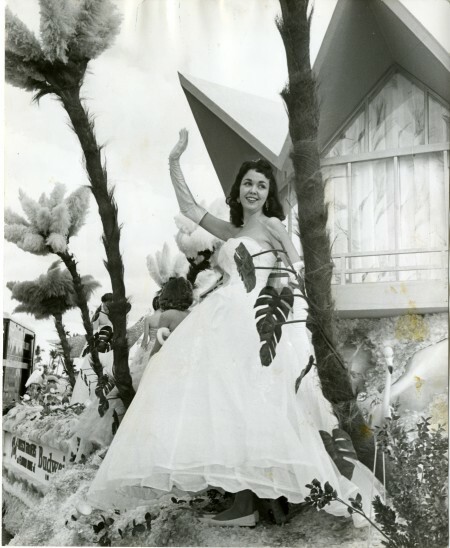 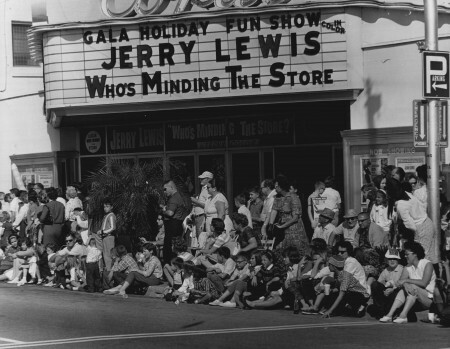 The first televised parade was in 1949 by Miami’s first TV station, WTVJ. In 1958, the event was beamed to the entire nation, a powerful tool that tourism officials have banked on ever since. 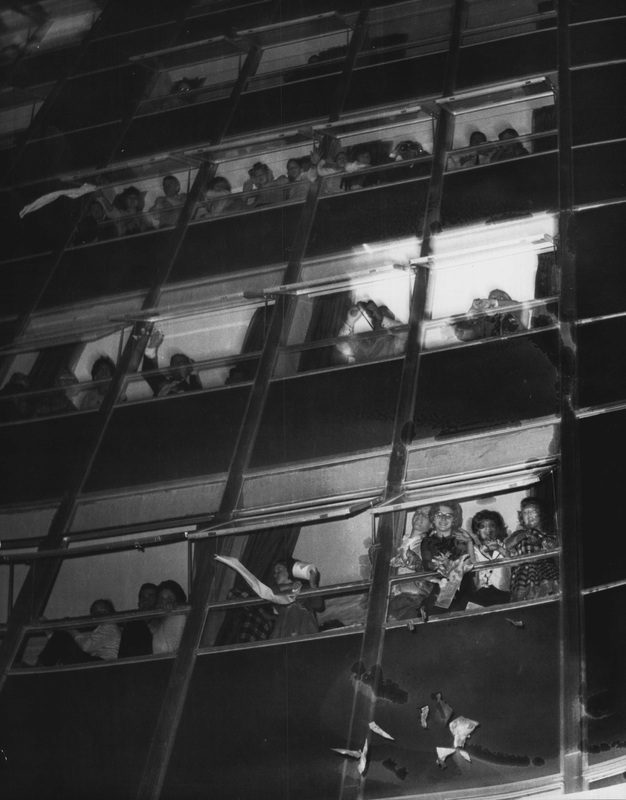 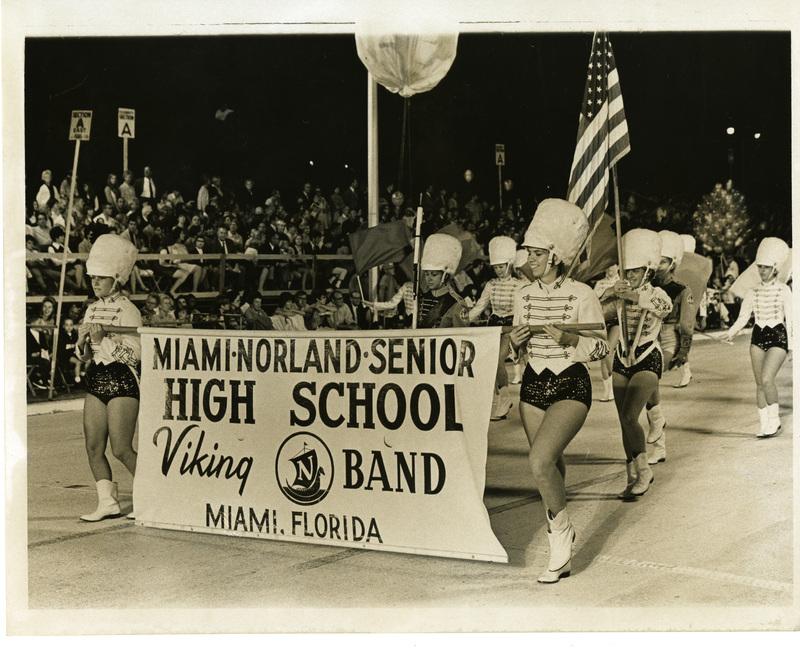 By 2001 the spectacle that once attracted 500,000 people to Miami’s Biscayne Boulevard could not lure even half that number so after seven decades of lights, music and swagger the parade was cancelled. 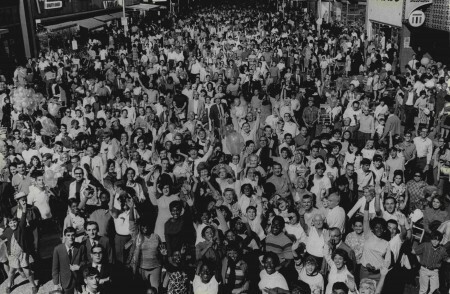 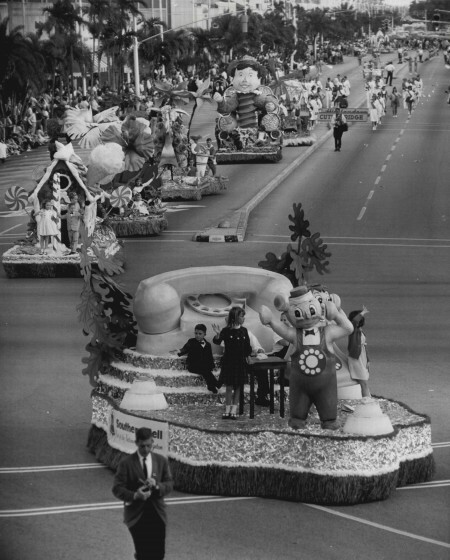 Undated: Orange Bowl Parade spectators. 1/2/1965: Theme of Southern Bell Float is international understanding. 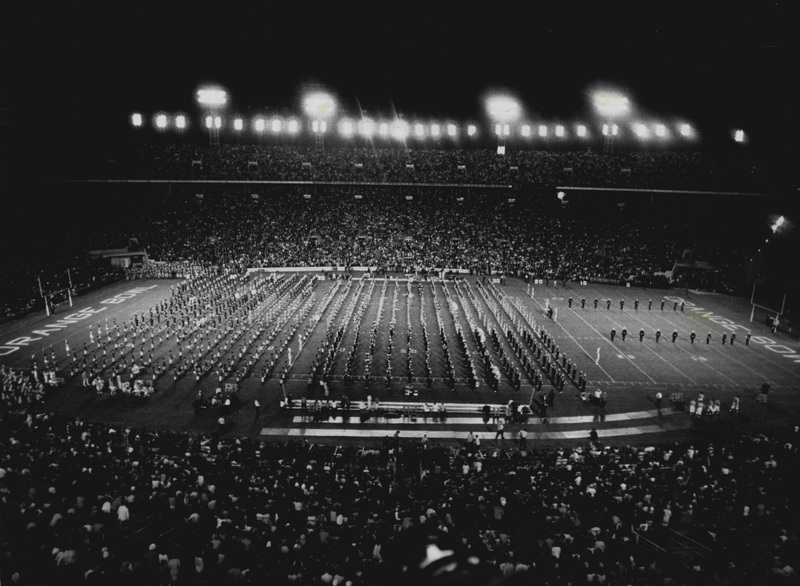 1/2/1966: Massed bands signal the start of an evening of football, music and extravagant spectacle. 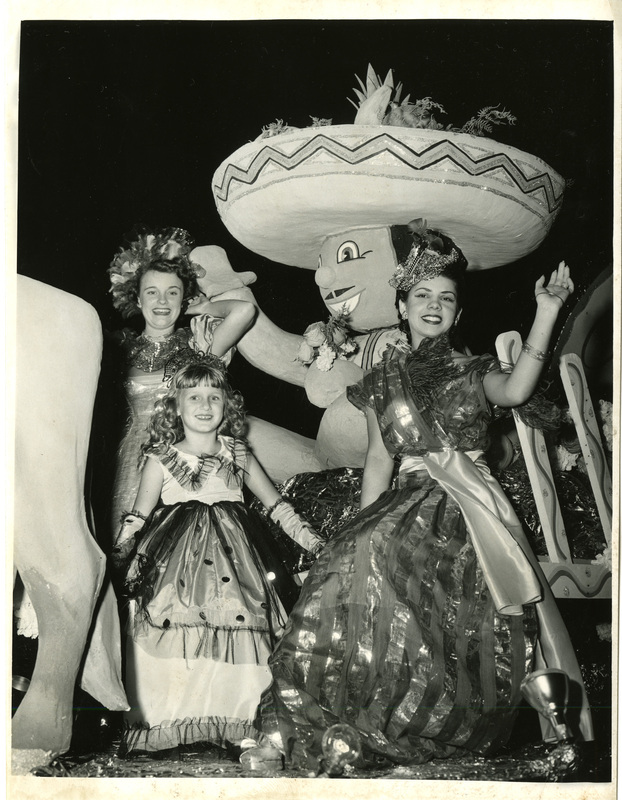 12/29/1965, Bill Sanders/Miami Herald: Some of the many beautiful floats decorated in themes for the young. 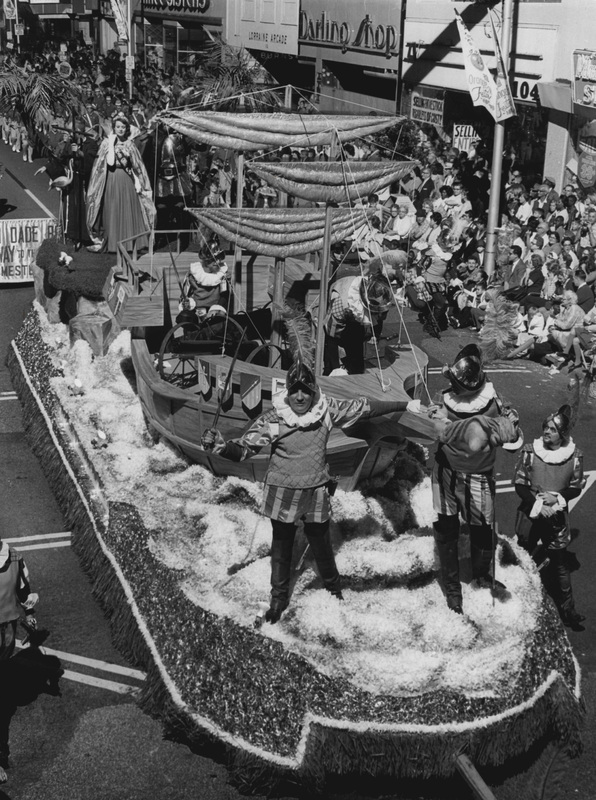 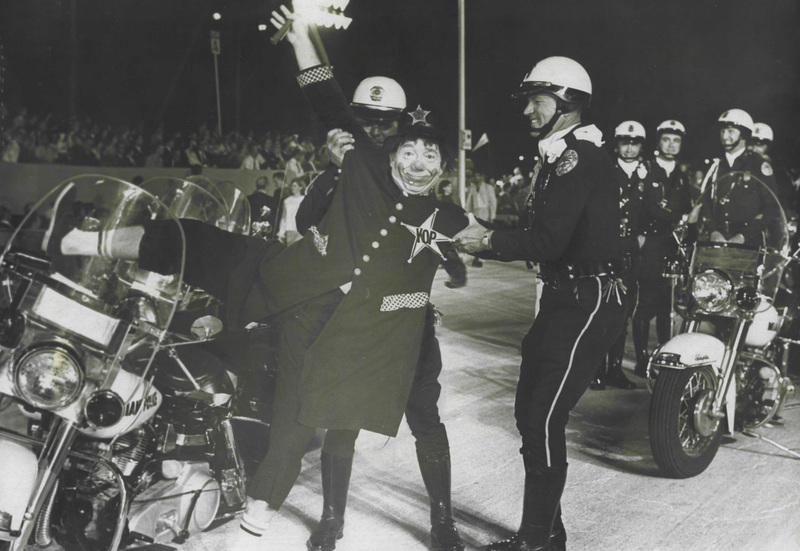 1966: Helmeted Spaniards flash swords on Bradenton float. 10/5/1951: Three Wise Men float. 1/2/1965: Her majesty, Linda Egland, star of the show. 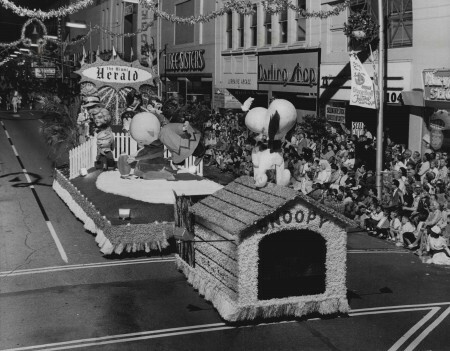 1/1/1966: Charlie Brown kicks off big doins' inThe Herald's Comic Strip Land float. 1/1/1965: Fountains and the Queen's Minute Maid. 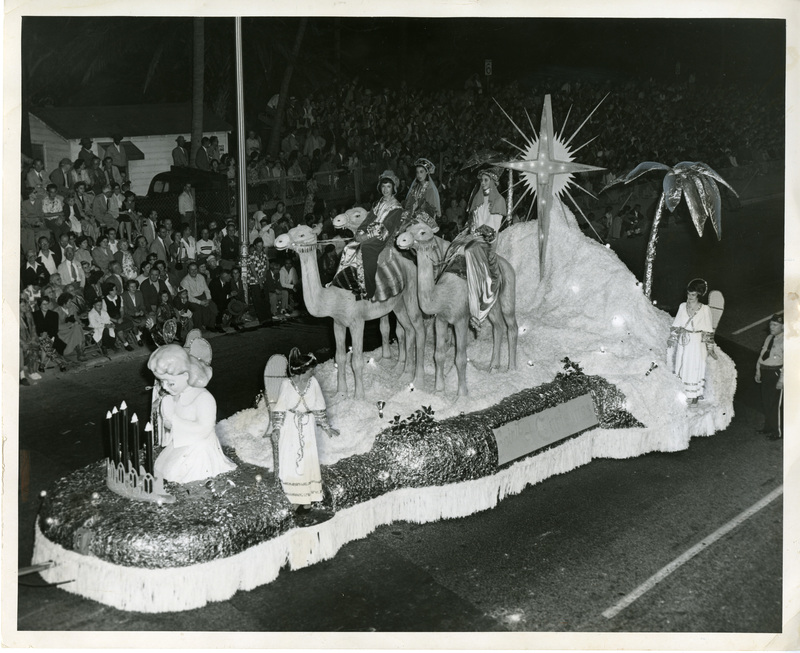 1/2/1965: Orange Bowl Parade float. 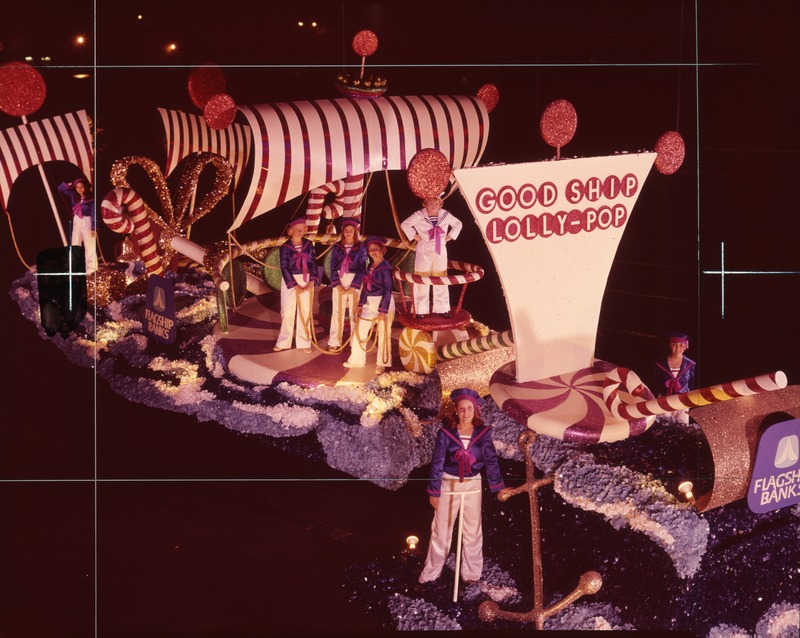 12/31/1976: John Pineda/Miami Herald Staff -- Good Ship Lolly-Pop float in 1976 Orange Bowl Parade. 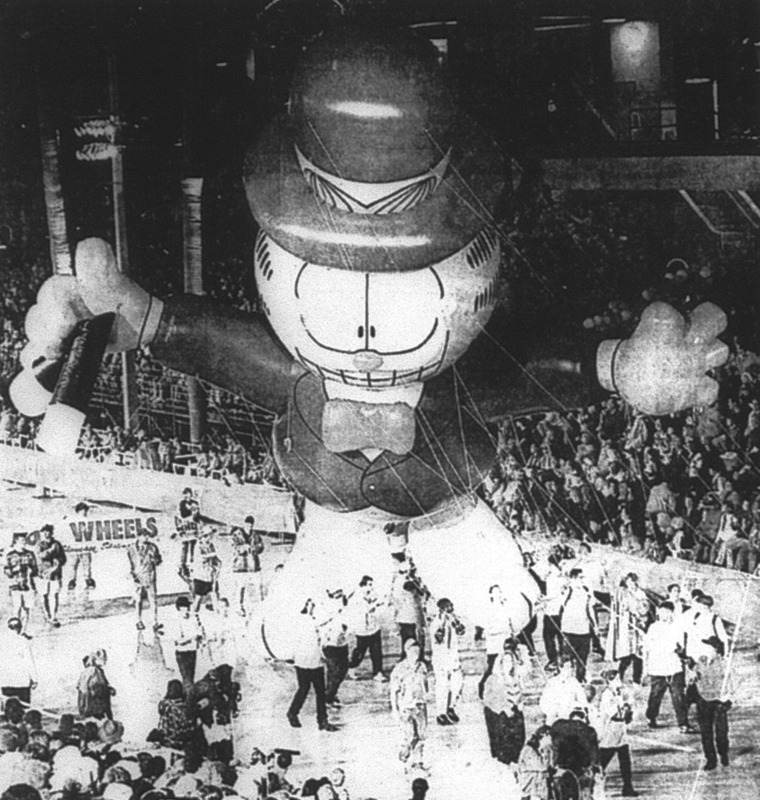 This image was the lead picture on 1A of the State Edition January 1, 1977. 1969: Miami Norland Senior High School Viking Band. 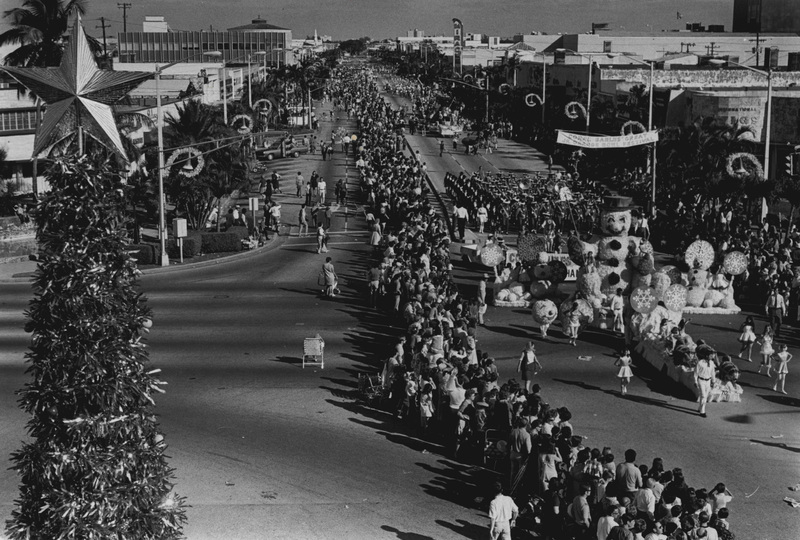 12/29/1969, Doug Kennedy/Miami Herald: Orange Bowl Junior Parade. 12/31/1964: From the files of The Miami Herald -- A parade of history's bathing beauties marches across Burdine's float in Orange Bowl Parade. 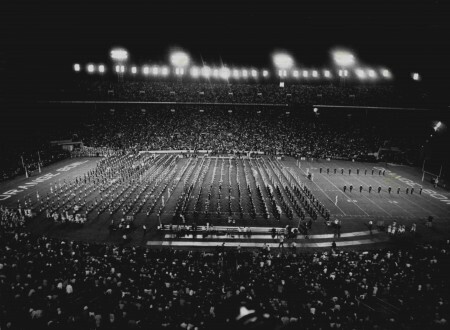 12/31/1995: C.W. 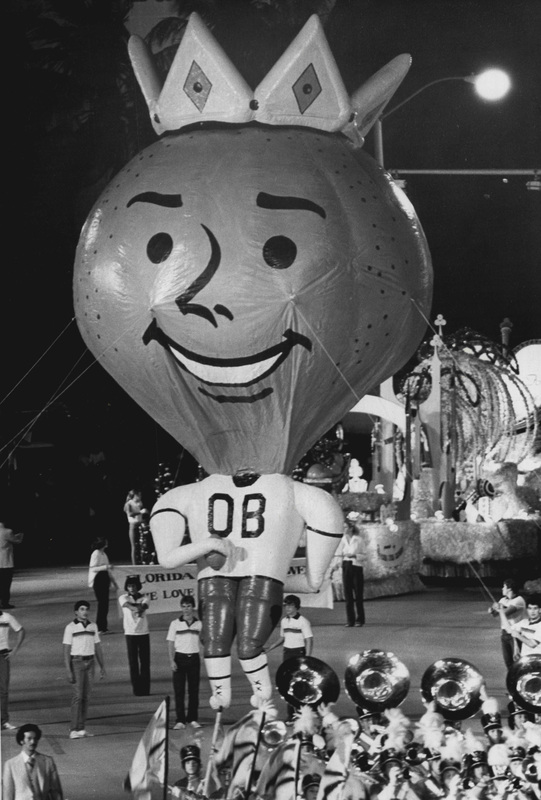 Griffin/Miami Herald Staff: A giant Garfield balloon looms over Biscayne Boulevard during the Orange Bowl Parade. 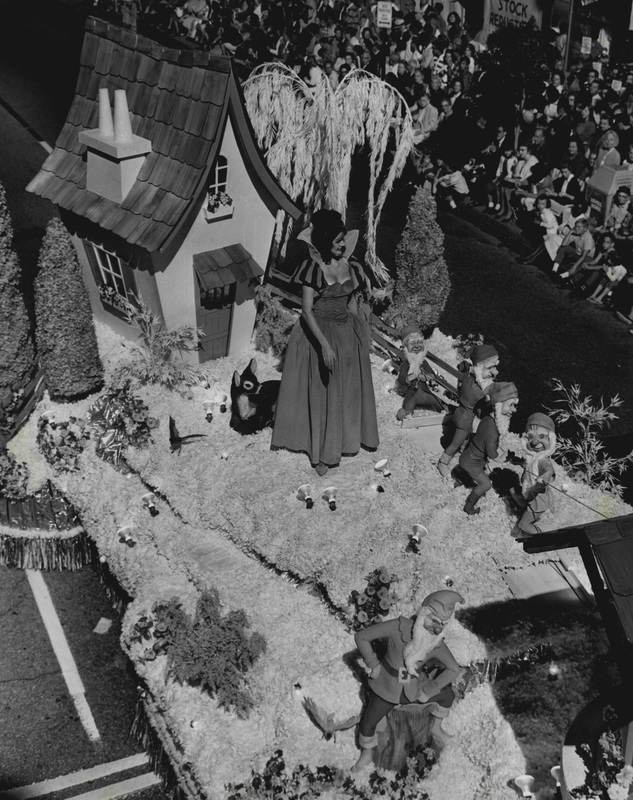 This image was scanned from black and white newspaper microfilm. 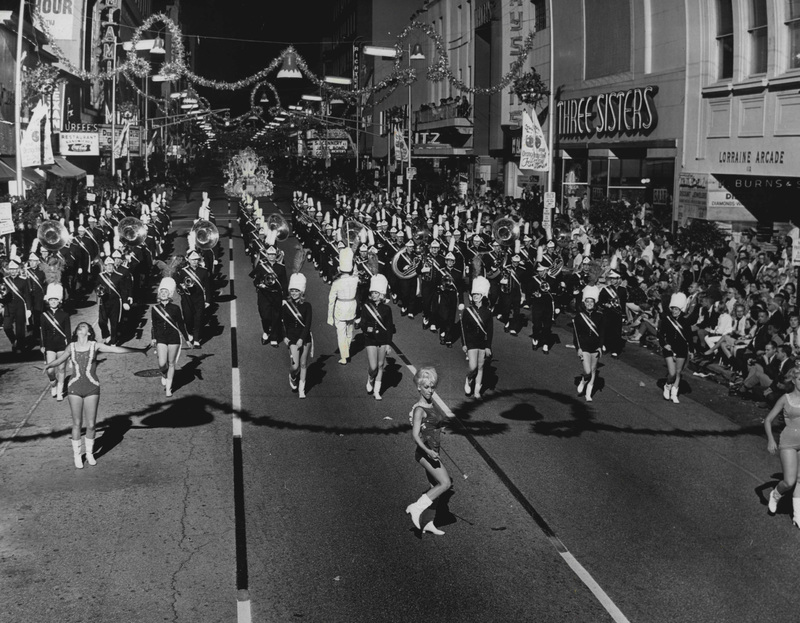 1/2/1965: The Heart of a Parade - A Big Brass Band. 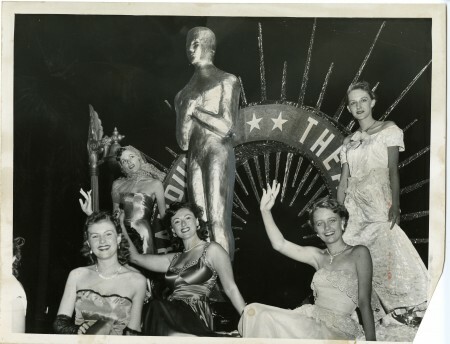 1/2/1965: Lovely ladies set mood for the parade. 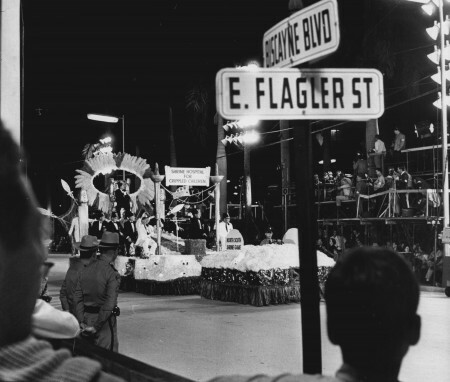 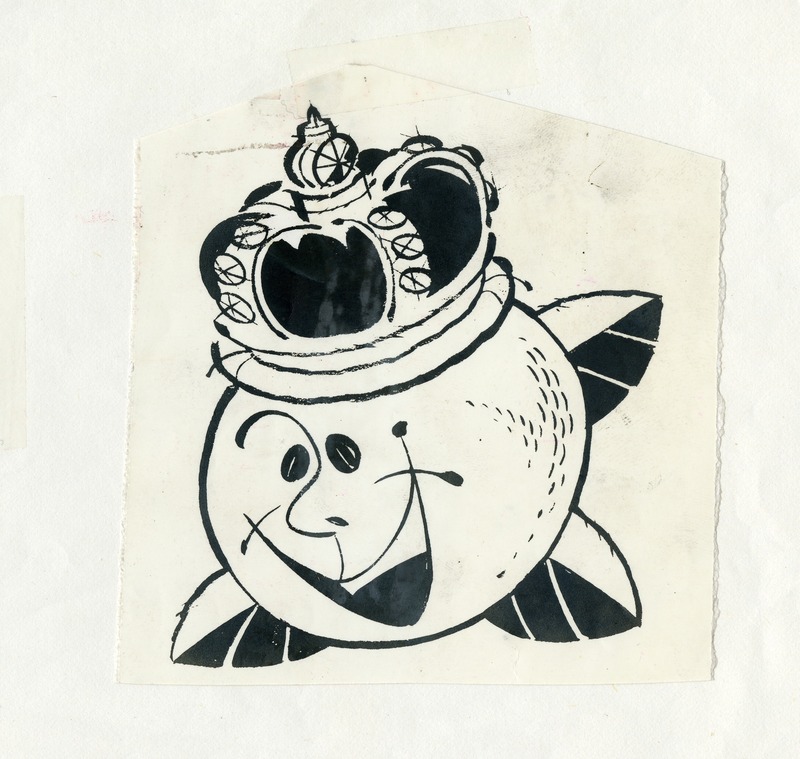 1/1/1965, Bob East/Miami Herald: Snow White smiles her way along King Orange's Street. 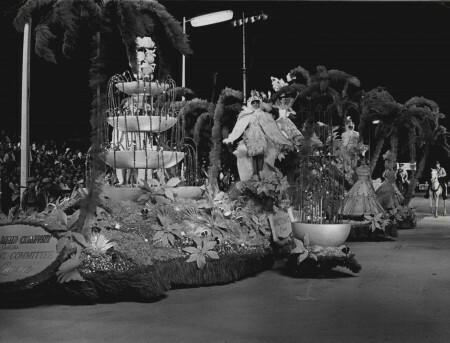 1/2/1960: Queen Nancy mounts up for a safari into the halftime jungle. 12/28/1963, Bill Sanders/Miami Herald: Orange Bowl Parade. 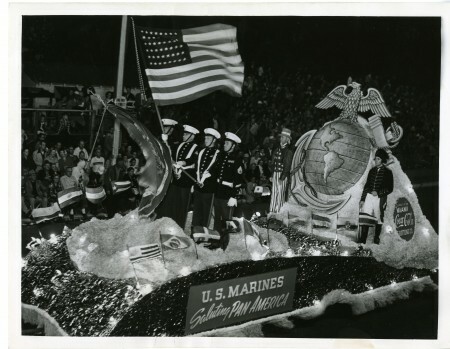 12/31/1949: U.S. Marines Saluting Pan America.